What Is Fabric Wrapped Foam? If you have noise-related issues you’re looking to resolve, fabric wrapped foam is the solution to your problems. Fabric wrapped foam is composed of non-woven and flame-resistant fabric. Due to its foam construction, it is able to absorb sound in an acoustical setting without letting in outside noise. 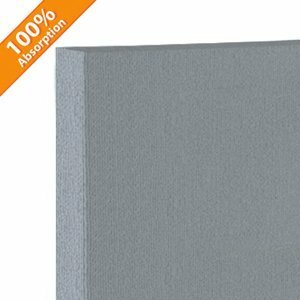 Thus, fabric wrapped foam excellently advances sound quality wherever it is installed. Udderly Quiet™ Fabric Covered Foam 3"
Our foam is crafted with qualities that ensure superior acoustic performance. Whether the foam is installed for use in auditoriums or offices, the superior quality of our fabric wrapped foam produces the desired level of noise reduction wherever echoing sounds are an issue. Our easy-to-install product assures simple set up with only minimal use of basic hand tools. Once installed, our Udderly Quiet™ Fabric Covered Foam takes care of the rest. Additionally, due to the flexible nature of our acoustic panels, it’s easy to add virtually anywhere you need it. Whether it’s on a curved wall or wrapped around columns and posts, our high-quality fabric wrapped foam gives you the sound absorption you need. If you’re worried about the potential for bacteria formation, dirt or moisture build-up, don’t be. The fabric is simple to clean and mildew resistant. Our fabric wrapped foam will also inhibit the discharge of airborne particles, ensuring optimal sanitization and cleanliness. While built to perform, Udderly Quiet™ Fabric Covered Foam is made to display as well. Whether your preexisting color scheme is bold or simplistic, the eclectic variety of colors available ensures a complementary match with any décor. The variety of sizes and colors available provides the diversity necessary to suit an array of settings. 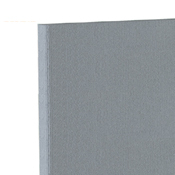 Udderly Quiet™ Fabric Covered Foam is ideal for any location desiring noise reduction. If you’re looking to keep interior noise in and exterior noise out, our fabric covered foam provides you with the tools necessary to fulfill your noise necessities. Learn more about soundproofing or contact a professional today to ensure your space receives the level of sound quality it deserves.